A Golden Retriever named Todd in Anthem is known to the nation now as a very good boy after his owner says he saved her from a rattlesnake bite. Paula Godwin told ABC15 earlier this month that she was on a hike with her dogs near 7th Street and Carefree when she almost stepped on a rattlesnake. She said there was no warning rattle and the snake was well hidden. She believes that if Todd had not seen the snake and jumped in front of her, she would have stepped on it. Instead, he took a bite from the snake and is now recovering. "He totally saved me from being bit," Godwin explained. "And he's my hero." Experts with Southern Arizona Veterinary Specialty and Emergency Center list safety tips on their website, as often times, the owner will not see the actual strike happen. The center said if you notice a bleeding puncture wound, swelling and bruising in the area, your dog has slow breath and is whimpering in pain or has sluggish behavior - those are all signs your pet has been struck and needs immediate emergency care. Those are the signs Valley dog owner Erin Kirkpatrick saw after her dog came back to her while they were visiting Sedona. "Trooper" lived up to his name when she realized he had been bitten by a rattlesnake. "It was probably about 45 minutes from the time of the bite and he was already shaking and vomiting," Kirkpatrick explained. "And kind of in and out of consciousness." Kirkpatrick said she was so scared to see her big, 100-pound golden retriever taken down so quickly by a single strike to the snout. Fortunately, he is okay now. A local veterinarian confirmed the rattlesnake bite and provided anti-venom - something Kirkpatrick said was quite an expense. She said she is also keeping Trooper on a tight leash for any other trips. Kirkpatrick believes her dog was simply curious and wanted to investigate what the slithering thing was. 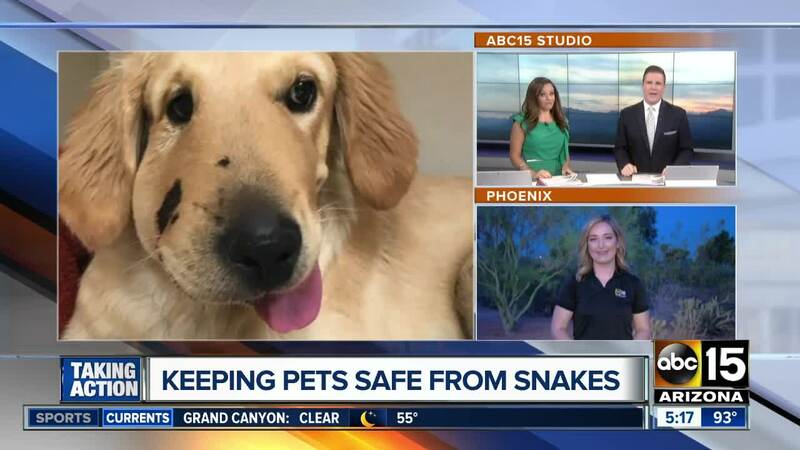 After hearing about Todd and Trooper's stories, ABC15 decided to take action and show viewers what you can do to ensure your dog does not become a victim of a rattlesnake bite. 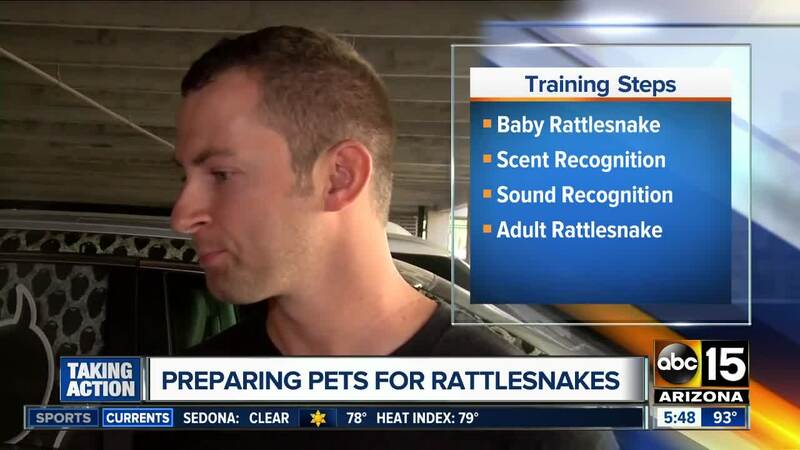 "Dogs are very curious animals," said Cody Will who trains dogs with his company, Rattlesnake Ready, LLC. "They experience the world with their nose and so, essentially, anything new and exciting they want to go sniff it." Will uses a four-step process that he said only takes about 20 to 30 minutes to train your dog to stay away from a rattlesnake. 1. Juvenile Rattlesnake: We begin by exposing the dog to a safely-muzzled, live, juvenile* rattlesnake. It is placed in an open, highly visible area for maximum exposure. Without our influence, the dog is left to find the snake. When they do, most dogs are more than happy to investigate the snake. As soon as they are too close, they are given a static correction using the e-collar until they understand to keep their distance. Because I allow the dogs to get right up to the snake on an open surface with good contrast, they make the correct associations almost immediately. Having found your dog's sweet spot setting on the collar (just enough to teach, not traumatize!) and once they are maintaining a safe distance from the snake, we move on. Most of the learning occurs in this step. 2. Isolated Scent Recognition: This supplementary step exposes the dog to the smells of rattlesnakes. The dog is left to approach a scented object on their own terms. Should they choose to stick their nose on the items, after getting a good “whiff” they are given a moderate static correction which implants within their mind that even just the smell is bad. This is in case the dog is ever poking around inside holes, under logs, etc. and comes across this smell again without seeing or hearing the snake; they’ll know it is a threat as they associate the discomfort from training with the smell. *If your dog has a good nose and got close to the juvenile snake initially, it is likely that he/she will know to avoid the scented items too having learned the smell from the real thing in step 1! Therefore it is fairly common for dogs to not need correcting at this step. 4. Adult Rattlesnake : The final step exposes them once again to a real rattlesnake-this time a large adult. This is so that they are aware that snakes come in different sizes. Most dogs will already show complete avoidance by this point, and therefore require minimal to zero correcting. Here they are given the chance to put it all together with multiple scenarios and approaches, by placing the snake in several places of varying difficulty to spot. When no mistakes are made and the dog clearly and consistently wants nothing to do with the snake – congratulations! Training complete. "It's a one-time lesson that convinces them to leave them [a snake] alone," Will explained.